Daniel Goodwin was born in Geneva, New York, in January of 1799. He was educated in the east and graduated from Union College in 1819. He trained in the law with one of New York’s most able lawyers – John C. Spencer of Canandaigua. 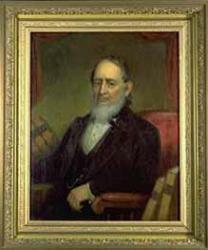 Before Michigan became a state, he was appointed its United States District Attorney, and in 1843 he was appointed Judge of the First Circuit and Associate Justice of the Michigan Supreme Court, a position he held until his resignation in 1846. In 1851 he was elected a Circuit Judge in the Upper Peninsula and served on that bench for 30 years. He was not only an enthusiastic lawyer but was also an active politician. He was also, to some extent, a military man. In the celebrated contest when Michigan nearly went to war with Ohio, he was a field officer and very zealous in service. When the time came for the state to prepare for admission into the Union, Goodwin was one of the most prominent men interested in the matter and was nominated to the Senate and confirmed as District Attorney of the United States several months before the Michigan was admitted. Everyone who is familiar with Michigan history knows that a majority of the state’s citizens strongly opposed Congress’ proposal that Michigan give up a strip of land on the lower part of the state to Ohio. The chances of admission to the Union seemed remote. After the rejection of this proposition by the regular convention, some members of the Democratic Party proposed a convention of their own at Ann Arbor, and that body, which had no legal standing, adopted the proposition of Congress. Under that action, or at least with that for a pretext, Michigan got into the Union.